You have an unique chance to save extra money at carter's stores in the U.S. It is very easy. Print the coupon and receive 20% discount on your in-store purchase of $40 or more. Or, take 15% off your entire purchase (no minimum spending). Coupon must be printed and shown during the time of your purchase at register Source of the information is carter's. 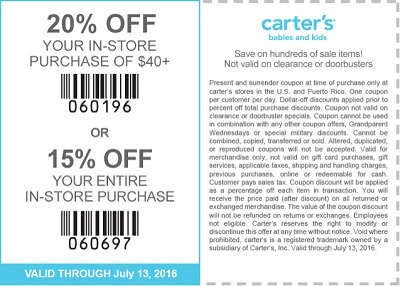 For more details visit any carter's store in the U.S. Offer is valid until July 13, 2016.